Dropping a Class Isn't a Failure. It's a Tactical Decision. Dropping a Class Isn’t a Failure. It’s a Tactical Decision. In our wide world there exists a variety of objects that generally should not be dropped. Bowling balls, containers of pure sodium, that kind of thing. However, there are also many things that you should drop, such as fire ants. And “the subject”, when your uncle Gary brings up politics at Thanksgiving. And also… classes. In last week’s video on how to deal with burnout as a student, we looked at some research which revealed that academic overload is the most common cause of long-term student stress – and that’s why in this one, I want to argue that it’s definitely ok to drop classes. Many students view dropping a class as tantamount to flat-out failing that class, and I understand their reasoning. We have ideals that tell us to stick with our commitments – to follow through. Those that persevere through adversity will succeed, while those that give up partway through are doomed to a life of regret and a distinct lack of sports car purchases. Let’s dispense with the inspiring platitudes here, though. Yes, perseverance is a virtue worth cultivating, and yes, in general, you should approach each of the things you commit to with the intention of seeing them through. But there’s an element of tactical decision-making to be injected here, especially with respect to your class schedule. This is because many ambitious students tend to over-commit when they’re signing up for classes. I’ve been in the same position you’ve probably found yourself in; it’s time to sign up, and you’ve found a ton of courses in the course catalog that sound really interesting. You’re thinking about the start of the next semester, and since you associate the start of every semester with ideas of fresh beginnings and full stocks of willpower, you feel like you can take on a ton of classes. So, say you’ve fallen victim to this line of thinking, and now you’re realizing that the workload you’ve signed yourself up for is just too much. The solution is simple: Drop a class. Check out the video to find out why doing so can be an effective strategy for managing your schedule, and why it’s unlikely to affect you negatively. 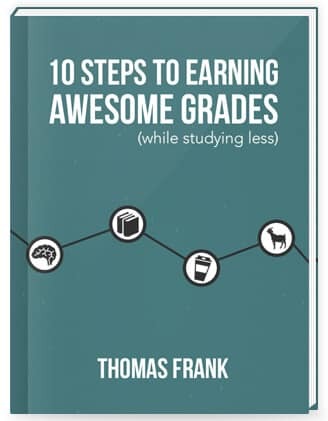 If you enjoyed this video, you’ll find lots of other tips in my free 100+ page book called 10 Steps to Earning Awesome Grades (While Studying Less). After you sign up and confirm your email, you’ll get a link to a special page to download the book. Scroll down and you’ll find the spreadsheet as well. Have you dropped classes before? What were your reasons?